A few words -- full review coming much later or better yet, tomorrow, because Opera Chic is tired after a champagne-fueled Carnevale weekend in Venice -- on Graham Vick's staging of La Rondine that last night opened the season at Teatro La Fenice. 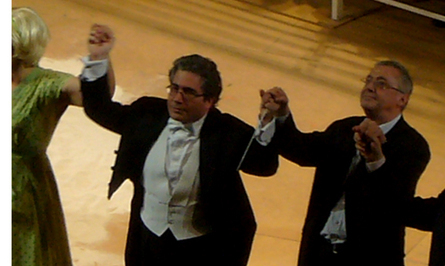 La Rondine, a very interesting, surprising Puccini that in modern times hasn't really found the audience it deserves -- suffice to say, in its 1917 premiere in Monte Carlo, the opera had the best conductor of the 20th Century and the best tenore di grazia, Marinuzzi and Schipa of course, and so much for "minor" works -- has been staged by our main man Graham Vick with Act I as commedia brillante, a sophisticated comedy from Hollywood's golden era that could have been made by Gregory La Cava or Jean Negulesco, Act II as a funny sendup -- with Jayne Mansfield lookalike supervixens, hawt sailors and giant Moulin Rouge pinup girls neon statues -- on Puccini's own Cafe Momus scene, and Act III as a minimalist, abstract beach where the end of love makes -- literally -- the sky fall down to earth. And Vick adds a final scene -- Casablanca in reverse -- that gives depth to a truly problematic libretto (that after 1917 was revised many times, since Puccini himself was far from satisfied). Fiorenza Cedolins was Magda -- a correct Magda, with strong dramatic presence and good looks and undeniable charisma, but then OC does not subscribe to her cult, as I'll explain later. The rest of the cast, we'd rather not discuss. But then, it was Signor Vick's night.